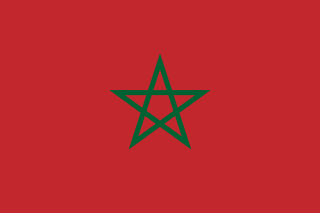 Fitxategi:Flag of Morocco.svg - Wikipedia, entziklopedia askea. SVG fitxategi honen PNG aurreikuspenaren tamainia: 800 × 533 pixel. Bestelako bereizmenak: 320 × 213 pixel | 640 × 427 pixel | 1.024 × 683 pixel | 1.280 × 853 pixel | 900 × 600 pixel. Data 17 September 2005, based on the Moroccan royal decree of 17 November 1915. Translation: Cherifian Dahir number 1.05.99 issued in 20 Shawwal 1426 (23 November 2005) about the characteristics of the Kingdom's emblem and national anthem — In accordance with the seventh article of the constitution, the emblem of the Kingdom shall be a red flag with a five-pointed green star in the center. The flag shall be made with fabric of canna red, opaque and rectangular in shape. The star shall be open, green like the leaf of palm trees, made of five continuous branches and woven in the same fabric where it must be visible on both sides of the flag. One of its points must point upwards. The hoist of the flag equals two thirds (2/3) of its fly. The star is inscribed in an invisible circle whose radius equals one sixth (1/6) of the fly's length and whose centre is the intersection point of the invisible diagonal lines of the flag's rectangular. The width of each one of the branchs of the star shall be 1/20 of its length. This is another type of work and 70 years have passed since the year of the author's death. 01:29, 27 otsaila 2015 900 × 600 (2 KB) Fry1989 No construction sheet provided that 1915 proportions are no longer in effect.